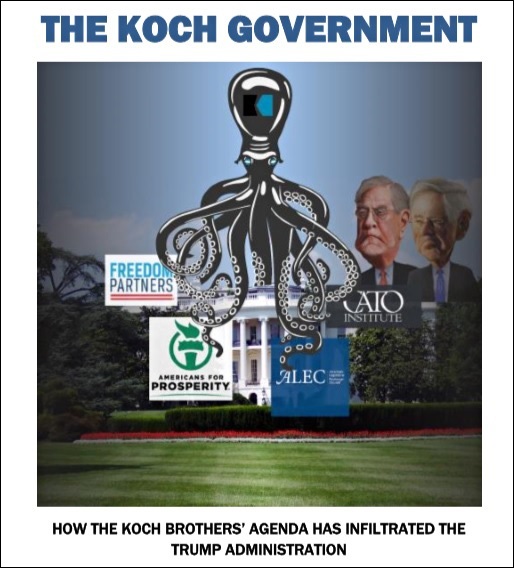 As we have previously reported, there is indisputable documentation that Charles Koch, the fossil fuels billionaire who sits at the helm of Koch Industries, is in charge of the de-regulatory agenda in the Trump administration through a web of front groups. More proof came yesterday. Reuters announced that the Trump administration had “formally told” around 40 staff members of the Office of Financial Research (OFR) that “they will lose their jobs as part of a broader reorganization of the agency….” Reuters also reported that the agency’s budget has already been cut by 25 percent “to around $76 million.” Imagine having only $76 million to police an industry where just one of the big Wall Street banks, JPMorgan Chase, had profits of $8.32 billion in its last quarter. Charles Koch has long understood that if you can’t repeal the legislation that created the Federal agency, get your lackies in Congress to gut its funding and gut its staff. The OFR was created under the Dodd-Frank financial reform legislation of 2010 to issue public research reports and keep the Financial Stability Oversight Council (F-SOC) informed on emerging threats that have the potential to implode the financial system — as occurred in 2008 in the worst financial crash since the Great Depression. Two of OFR’s most important research findings are that Wall Street remains dangerously interconnected (See Financial System of U.S. Rests on Health of Just Five Mega Banks) and that the Federal Reserve has left the country at financial risk by using the wrong design for its stress tests. (See Treasury Drops a Bombshell: Fed’s Stress Tests Get It Wrong.) Congress has failed to address either of these critical areas. Why would a fossil fuels conglomerate care about policing of the financial services industry? Because Koch Industries also has a vast commodities trading operation called Koch Supply & Trading with offices in Houston, New York City, Wichita, Mexico City, London, Geneva, Singapore, and Shanghai. According to its website, it trades crude oil, refined products and derivatives, metals, interest rates and currency futures, among other things. Being able to operate off the radar screen of the prying eyes of Federal regulators is part of its highly profitable business model. But gutting OFR’s budget and sacking its staff is not the full agenda. Putting one of its loyalists in charge of the agency completes the picture. The bio that the White House released in its statement said nothing about Falaschetti’s ties to Koch-funded front groups. But those ties are substantial. 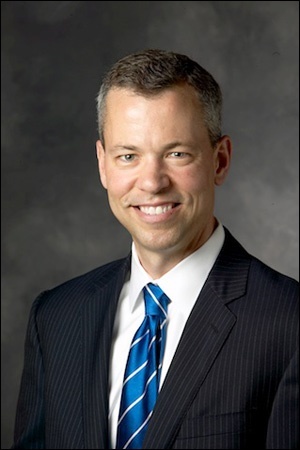 Falaschetti was previously a Senior Research Fellow and Director of Outreach for Financial and Economic Policy at the Mercatus Center at George Mason University. 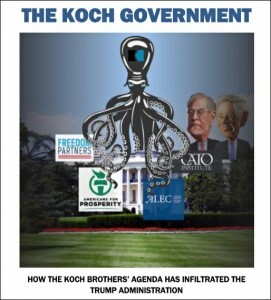 According to SourceWatch, the “Mercatus Center was founded and is funded by the Koch Family Foundations. According to financial records, the Koch family has contributed more than thirty million dollars to George Mason University, much of which has gone to the Mercatus Center, a nonprofit organization.” Sitting on the Board at Mercatus is Charles Koch, Chairman and CEO of Koch Industries, and Richard Fink, a former longtime Koch Industries executive who is now Vice Chairman of the Board of Directors of the Charles Koch Foundation and the Charles Koch Institute. Falaschetti also sits on the Research Advisory Council of The James Madison Institute (JMI), another Koch-funded front group. According to SourceWatch, JMI has received over $1.3 million from the Koch-related Donors Trust and Donors Capital Fund between 2005 and 2014. It also received, according to SourceWatch, $286,384 between 2007 and 2014 from the Charles G. Koch Foundation. In July of 2016, 19 Democratic U.S. Senators took turns speaking on the Senate floor about the Koch-funded front groups that were responsible “for perpetrating a sprawling web of misdirection and disinformation to block action on climate change,” according to the press release issued at the time. Some of the Senators compared the front groups to those that Big Tobacco had used to deny the dangerous health impact of cigarette smoking for decades until the industry’s documents were exposed in the government’s big lawsuit against the industry. In a 2015 article, we reported that a Koch-created group, Citizens for a Sound Economy (CSE), was directly involved with the tobacco industry in downplaying the dangerous effects of cigarette smoking. The video below captures the statements of six of those courageous Senators who spoke in 2016. The full video runs one hour and 22 minutes. We suggest it is the most important one hour and 22 minutes you could spend in your lifetime to inform yourself on who owns your government and why it is no longer working for the American people.